TRUST - We really are Hertfordshires largest Stone company. Our biggest project to date required us to lay granite flooring over an area equivalent to 20 football pitches. View our Case Studies. QUALITY - All our tops are bespoke and hand finished and we have won many quality awards. CONVENIENCE - Largest stone showrooms in Hertfordshire allows you to browse at your leisure a vast array of materials. PRICE - We offer a price match guarantee for like-for-like materials. SECURITY - Trading for over 30 years, our after sales support is fast and efficient. View our Case Studies. WARRANTY - 10 Year product guarantee supported by manufacturers warranties. Up to 50% savings! While stocks last. Find out more. Take the virtual tour around our showroom to learn about the types of stone Cawdor offers. We source, supply and install quality stone for kitchen worktops, bathrooms, fireplaces as well as many accessories. With over 30 years experience we are here to help you choose the right stone. We have one of the largest showrooms in the South East where you can see our fabricators working. Our products are produced using the latest CNC machinery and then hand finished by our highly experienced stone masons. Served by our large team, supplying projects from domestic homes to international airports. Our team are here to help with any queries you may have. Our emphasis is on friendly personal service together with expert advice. Fill out our callback form and we can call you back at a time that suits you. Browse our products online, call us or visit our showroom and select your desired stone. Our specialist templaters will then design and produce templates to exactly match your requirements. Once a quote is accepted our expert fabricators work on cutting & preparing the stone. Your stone is fully installed (and sealed where needed) by our qualified team. Let us guide you through the process of having a surface fitted with Cawdor Stone Gallery. Watch our walkthrough video to find out more. Want to see the full colour ranges? Click on a brand to see the full range they offer. Cawdor Stone Gallery provides premium quality granite and quartz kitchen worktops and surfaces throughout South East England. We care about you, our customer, and understand your needs. Having opened our doors in August 1986, we have become one of the leading stone suppliers both within the UK and internationally. With over 30 years of trading, we are proud to have won many industry awards. We specialise in providing a wide variety of natural stone and quartz surfaces to complement your home and you have access at our showroom to a qualified interior design team to assist your selection and ensure you are fully satisfied with your final choice of surfaces, these being guaranteed by Cawdor to provide many years of practical use whilst maintaining their beautiful aesthetic with minimal maintenance needs. 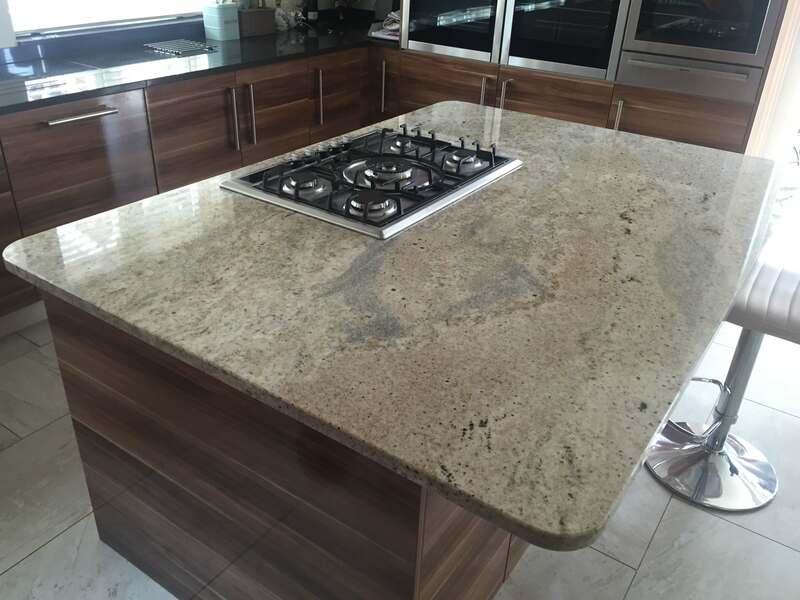 We provide a completely comprehensive service from material sourcing, through templating, fabrication and installation in your home. We also provide after-care products, advice and excellent after-sales service. 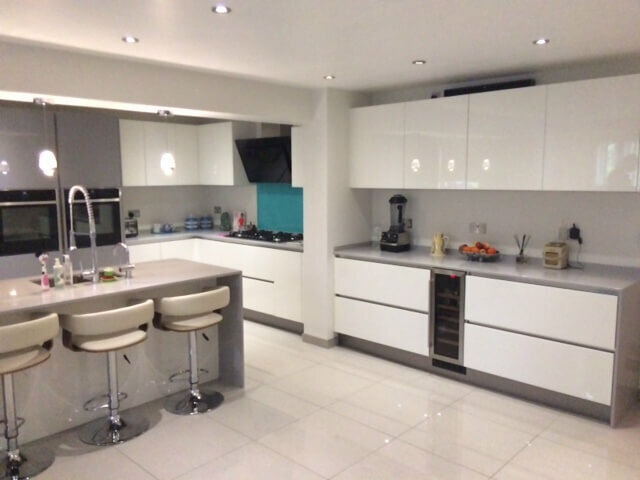 Our fast and efficient turnaround from receipt of order ensures minimal disruption whilst your kitchen is being fitted out. Talk to our expert team at Cawdor Stone Gallery for more information about our range of stone and quartz materials. We are based just outside Stevenage and well placed to service Welwyn, Hertford, St Albans and throughout Hertfordshire, Bedfordshire, Buckinghamshire, Essex, Middlesex and Greater London. View your stone using our virtual kitchen tool to see how it looks. All Cawdor products come with a full & genuine 10 year warranty. Our standard turnaround time is a week, but we can react to tighter deadlines as required. All of our worktops are wet cut and wet polished achieving a higher finish. Then fully sealed, when required, to protect and give lasting results. Our Granite, Marble & Quartz surfaces are all manufactured in our workshop using the latest CNC machinery & hand finished by our experienced stone masons. To give you an idea of typical costs, view our simple plan alongside our price lists. Based on our sample kitchen plan you can view our list of granite prices. Based on our sample kitchen plan you can view our list of quartz prices. Cawdor supplied us with new kitchen worktops made from Rosso Multicolour granite. The service was first class and we are delighted with he finished result. Easy to deal with , very prompt on site. Worktop looks amazing. Cawdor Stone excelled from start to finish. Highly recommended.